Imzadi: to the people of the planet Betazed, including Counselor Deanna Troi of the Starship Enterprise, it means 'beloved' and denotes a special closeness that can never be truly broken. Or can it? In his acclaimed earlier novel, Imzadi, bestselling author Peter David explored the special bond between Deanna Troi and Commander William T. Riker. It revealed new facets of their long and intimate relationship and put that bond to its ultimate test in a powerful and unforgettable story that remains one of the most popular Star Trek® adventures ever published. Now David examines the heart of Deanna Troi from an altogether different perspective, as he reveals for the first time the full story of Troi's troubled romance with Lieutenant Commander Worf. At first glance, they cannot be more different. She is an empath, gentle and acutely sensitive to the needs and feelings of others. He is a fierce Klingon warrior, dedicated to a harsh and warlike code of honor. Brought together, however, by a common need to care for Alexander, Worf's troubled, motherless son, they discover hidden reserves of courage and compassion within each other and embark on an unexpected courtship, much to the surprise and discomfort of William Riker. But does Worf's future truly lie with Deanna...or on a distant outpost called Deep Space 9? And whom indeed shall Troi ultimately call 'imzadi'? Imzadi II is a compelling story, an untold chapter in the history of the Starship Enterprise. I have only read the book. 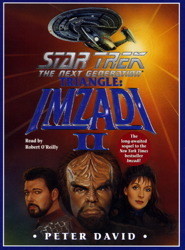 I listened to the first Imazadi on audiobook but I don't think I have had the pleasure of this Imzadi II. I imagine if it's anything like the first or the book, it would be great especially with the love triangle aspect.